Results from the National Survey of Student Engagement (NSSE) were presented to a mid-sized crowd of NIU faculty, staff and students by Renique Kersh, associate vice provost for student engagement and success, and Brandon Lagana, director of career services planning and assessment, on Thursday, Feb. 7. Recognizing the importance of sharing survey data more broadly that highlight student perceptions of their experiences at NIU, their presentation led to encouraging insights into why the NIU campus environment matters. NSSE results from 2018 demonstrated the consistent message from students that their interactions with faculty are valuable to their NIU experience. When students were asked about the most significant learning experience they have had at NIU, many identified the role that faculty have played in encouraging, challenging and supporting them toward successful outcomes. Such experiences have been thoroughly supported by years of higher education research on students and how they engage in their college environments in meaningful ways. Such work by Alexander Astin, a well-known higher education theorist, explored student affairs work related to student engagement and involvement. Astin developed a framework known as the Campus Ecology which suggests that, (1) students encounter environmental stimuli on college campuses that can lead to the adaptation or reinforcement of traits and behaviors; (2) students can cause adaptions to the campus environment; and (3) student outcomes (such as success, learning, etc.) occur as a result of their interaction with the campus environment (Renn and Reason, 2013). NIU responses to the NSSE multiple choice items indicated that discussions with diverse others is an area for growth for NIU in comparison to peer institutions; however, students’ comments are encouraging and further support our institutional efforts to continue to celebrate the diversity of our students. 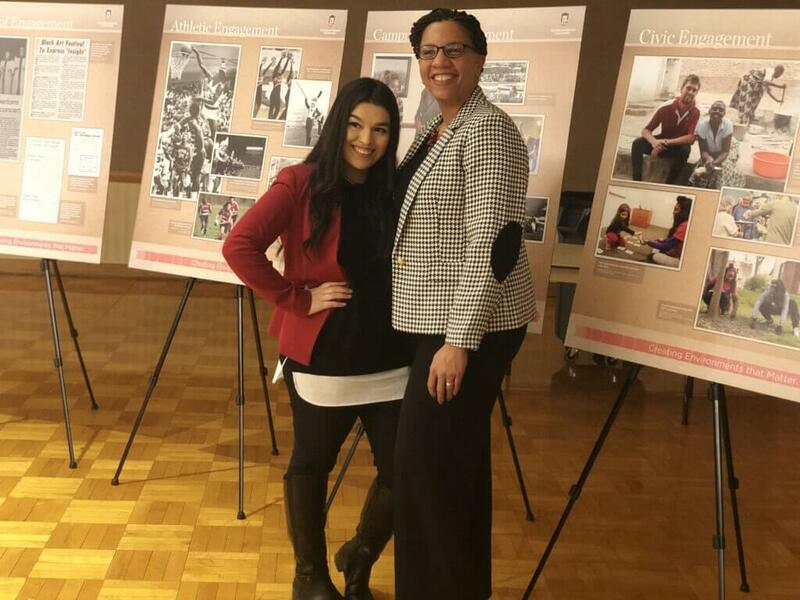 In addition to Kersh and Lagana’s presentation, Oriana Flores, an undergraduate College of Health and Human Sciences student, presented an engaging exhibit called, “Creating Environments that Matter,” that highlighted student engagement at NIU from the 1900s to present-day. The exhibit will also be available during the Undergraduate Research and Artistry Day and Community Engagement Showcase on Wednesday, April 17. The presentation and exhibit are just the beginning of an ongoing effort to share results of surveys to the broader NIU campus. Kersh and Lagana outlined next steps, which include developing a web presence that the NIU community can use to access student experience survey data and to further explore some of the questions that came out of the NSSE through focus groups. A report on the NIU student experience will be completed this summer.